Why it matters, and how you can fix it. The golden age of Facebook is upon us, but in a cruel twist, it has never been more difficult for organizations to organically connect with fans. Looking for a simple way to measurably boost fan reach + engagement? Then this post is for you. Facebook has become increasingly selective about what content reaches users as the volume of content has exceeded user capacity to absorb it all. Simply put, there’s just too much content out there, so less people see your content. Facebook’s recent changes to the News Feed algorithm have been particularly punishing. Forbes, for example, reported that posts reached as many as 25% of its page fans in the summer of 2013, but by winter its reach dropped to 2-5%. Further complicating matters, there’s evidence that many page fans across Facebook are fake. So of the 2-5% of people Forbes does reach, not all may be real. Ouch. The number of “Likes” a brand earns is withering into a vanity metric. You may invest in acquiring a new fan today, but to reach that fan in the future you’ll need to pay for promoted posts again and again. Even the most socially savvy organizations like Upworthy are vulnerable. How are you supposed to organically connect with consumers? Few organizations make it past Step 2. Typically, when someone clicks a Facebook Share button, the message that pops up is auto-populated according to settings established by the site admin (not the marketing team). Is your site admin a social sharing expert? 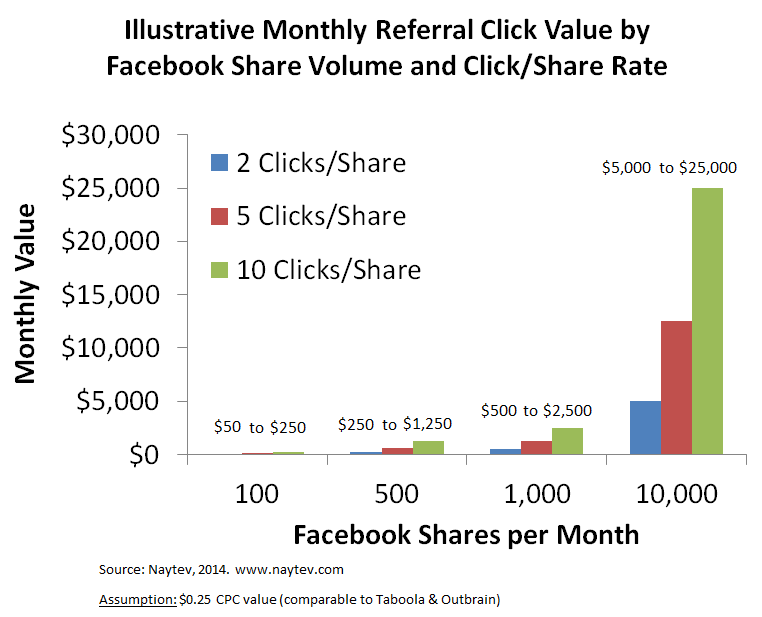 Social shares are free advertising. But the engagement and referrals they drive are only as good as their messaging. Most organizations don’t customize their messaging, and the performance of all messaging (custom or not) is subject to guesswork and chance. Writing and picking the best message is currently a pain – Facebook doesn’t provide a simple way to modify your messages, let alone test out different versions. It doesn’t have to be this way. Here comes the shameless plug! Wait for it…we eliminate this hassle and remove chance from the equation with Naytev. 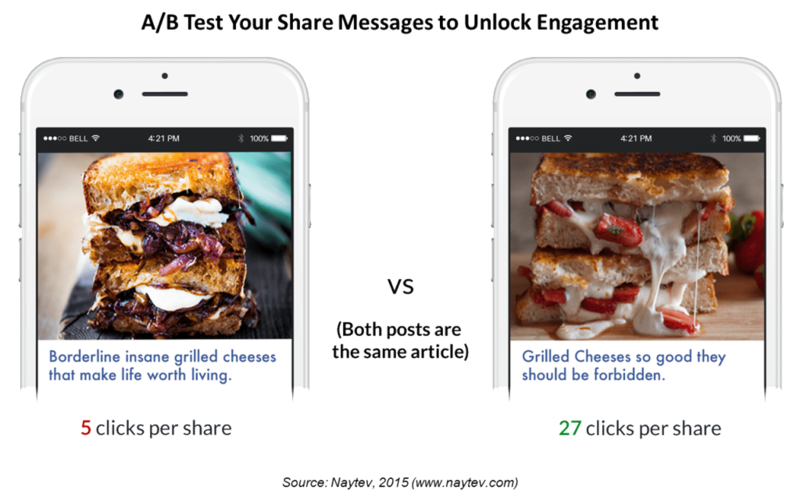 In less than 5 minutes, you can start editing the messages issued when people share your content. You can test different share messages as well. The best part? Our system tracks the performance of each message, and automatically uses the best performing version. How much more traffic and revenue would you have gotten if you used the best message every time? Social sharing optimization is a new baseline best practice in this era of declining organic reach. Naytev makes this best practice practical. Try Naytev for free today at www.naytev.com.